When we woke up we ate some hard boiled eggs before a few students joined Nate on his tour of the sanctuary of Tacugama. 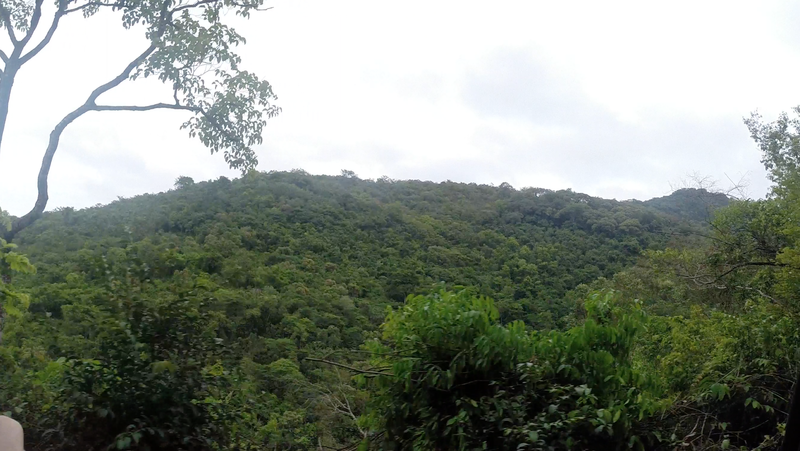 I decided to stay behind and enjoy the peace that came with an empty bungalow in the middle of a rainforest. It was such a beautiful place to be with your mind, that I couldn’t bring myself to sacrifice the time I could be alone to wander through the sanctuary surrounded by people. There are ancient trees here, covered in spots of lichen and orchids. While Lungi was hot and miserable, Tacugama is shaded and stays a pleasantly warm temperature all day, and even cool enough at night for a sweater. I can see several stag horns growing low on a young tree. I enjoy watching the ants go about their business as huge bumblebees buzz past and birds flit from branch to branch. Soon we will load our packs into the cars and pile on top of each other and begin the two hour drive to Marokie village. I just hope I can one day return to this magical place. It is hot and so humid, everything feels damp and every insect wants to bite you. 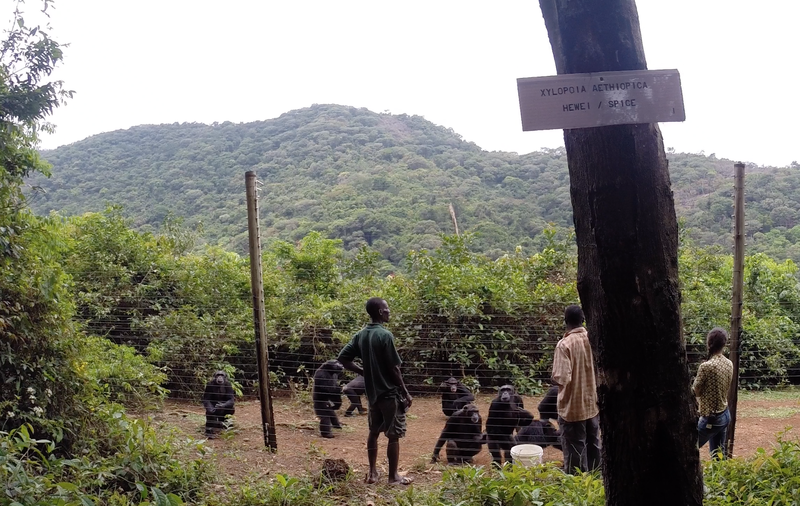 But when the breeze rustles the tree tops and the chimps call in the distance none of that matters. You only feel the age and experience of the arty around you. And everything is good. There were seven people in each of our two cars, which only had five seats each. This meant I had to sit on Nate’s lap with my back bent over, pressed up against the ceiling. 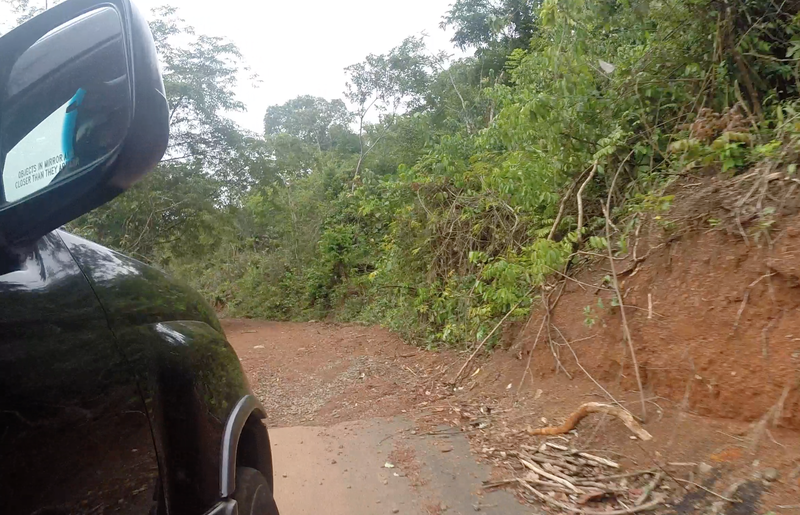 This was a particularly miserable spot on the way down from Tacugama as the sun blazed down on my legs making me sweat and the car bounced up and down in the many potholes causing my head to smack repeatedly against the ceiling or window. The air was buzzing with anticipation. We were on our way to Marokie, the village we had heard so much about and that would be our home for the next two and a half weeks. 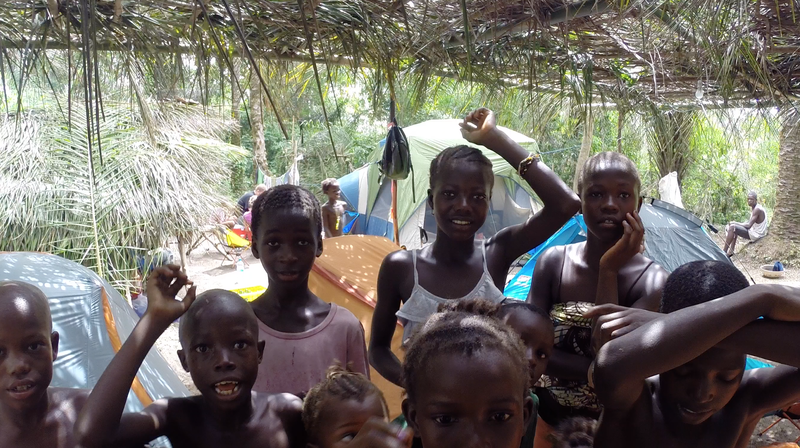 After 45 minutes of bouncing and sweating in the car we pulled over in a town called Waterloo where we were to pick up our guide from the Conservation Society of Sierra Leone, Papanie. Once in Waterloo we were able to wrangle another car, so I moved over to sit four to a bench seat rather than continue to sweat on poor Nate’s lap. There was a PhD on our trip who was looking into our field site. Dr. Catherine Bolten has worked in Sierra Leone since she finished her MPhil at the University of Cambridge and the war ended in 2002. She worked mostly in the town of Makeni and wrote the book I Did it to Save My Life: Love and Survival in Sierra Leone (If you want to know more about it, here is a review I found that I like, I haven’t gotten a chance to read it but will post a review as soon as I’m finished). She was fluent in Krio and I spent a good portion of this second leg of our trip asking her to translate the things we saw into Krio. I was mildly disappointed at how many words sounded just just like English, only with a heavy accent. She laughed as she told me ‘banana’ was ‘banana’ and ‘road’ was ‘road’ (although after further research, the spelling is different). Once I moved cars I left the familiar driver Hassan behind. Our new driver was young and pompous. He refused to listen to me when I wanted my window rolled up or down, and I had to ask Dr. Andrew, who was seated next to him, to turn and ask the driver to roll the window down. Cat later explained that this was because I was a woman, and he wouldn’t do anything I asked. He sped down the road, nodding every time Andrew asked if he was sure he knew where he was going. About an hour later, just before we reached the town called Mile 91 he sped up and passed Hassan’s car. We were weary, but trusted that he knew where he was going. “We make a turn just after Mile 91,” Andrew assured us, as we sat sweaty and uncomfortably close in the car. Ben had even resorted to sticking his legs out the window for intervals, just so he was able to stretch them. But our driver drove straight through Mile 91 and well beyond it, still saying “yes, yes, up ahead” whenever we asked if he was sure he knew where he was going. An hour and a half later and Papanie and Hassan were no longer behind us. The sun was starting to set. We were lost. Our driver had gone so far he had taken us out of Tonkolili and to a completely different district. Finally we convinced him to turn around, and drive an hour and a half back the way we had come. We were hot, tired and angry. And hungry. More than anything we were hungry. The children the next morning, since it was to dark to take pictures when I arrived. By the time we made it to Marokie it was not the excited arrival I had been imagining. As soon as I stepped out of the car 20 tiny hands immediately grabbed at my shirt, hands and breasts. The children cried out words that had no meaning and I looked around desperately for the people who had arrived hours ago, knowing they would have water. But it was not so easy to disentangle myself from the hoard of excited children. Finally I made my way to Brielle and Ryan, who had saved me a space to set my tent up next to theirs. Once my tent was erected and my bags packed safely inside I took a deep breath. I had made it.